A year or so ago we purchased a small flock of hens for a number of reasons but mostly because we’d always fancied ourselves as Tom and Barbara. I'd describe our garden fellows as a cross between housecoat-wearing buxom older women with ample hips à la Les Dawson and a kind of pre-historic Can-Can dancer, with their scaly dinosaur legs emerging from their beautiful fluffy under-feather skirt of the softest down. They are hilarious company, chatting away with a variety of noises and they are so entertaining to watch. A scratch here, a wiggle there, peck, peck, a frenzied fly chase, even their way of drinking is humorous. Several weeks down the line, now that we more or less know what we’re doing and aren’t on the chicken welfare 24hr hotline several times a week (for which read, texting and calling every friend we know who keeps hens,) I can step back and fully appreciate the benefits of keeping chickens when you have young children, especially those with additional needs. It might surprise you. 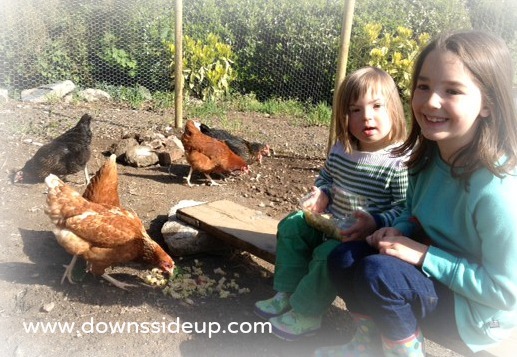 Here’s the thing… keeping chickens has been the most brilliant activity for the whole family. The shared excitement tinged with nervousness when we went to Nick’s barn to choose them was the best feeling. They then sat surprisingly calmly in boxes in the boot of the car as we took them home to their specially prepared enclosure and swish new recycled plastic house. We had spent weeks preparing for their arrival, which felt like the run up to Christmas. The children were bursting to release them and once we did, they happily made themselves at home immediately. ‘The White One’ even produced an egg on the first afternoon. I bet you could hear us squealing from where you sit! We then spent the next 2 hours just watching them go about their business, just being hens. Natty learnt immediately, and in a very visual and memorable way, where eggs come from and the unusual way in which chickens behave. Then came the task of choosing names. One name for a new cat or dog is fun…but six names at once, well you can really go to town on that. and Natty called hers Egg. Very clever I thought. Never underestimate the obvious. Everyone can take part with hen husbandry. The children can carry out little chores such as feeding, putting out fresh water and checking for eggs, with little supervision. My heart is in my mouth whenever Natty runs into the house carrying them, but I have to trust her, and she hasn't broken one yet. Natty was rather afraid at first when they flapped and pushed around her, but with patience and time she has begun to love them more and will pick them up spontaneously for a hug. Yes, I worry about the germs, but again I’ve used this to teach both girls the absolute importance of washing their hands thoroughly when they've been near the birds. This has been repeated so many times that it is now an automatic part of their routine, and Natty goes to do it without being asked. 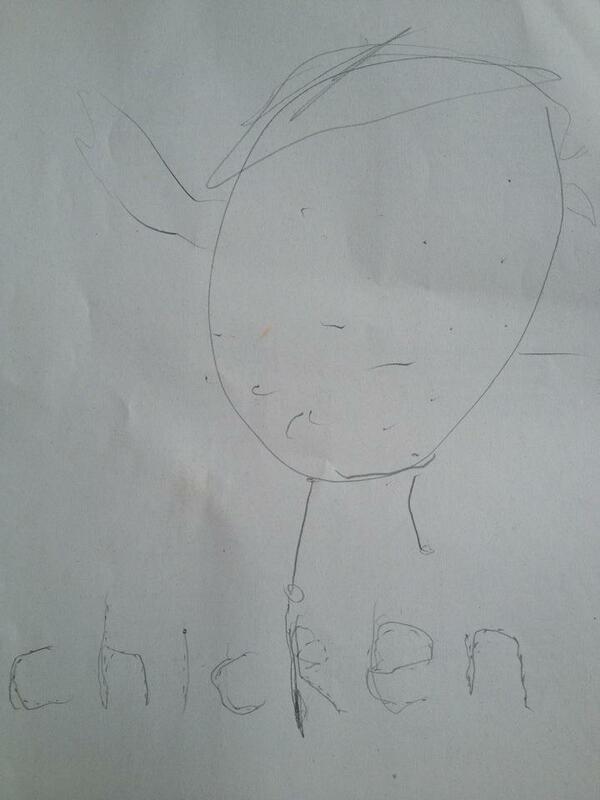 So thank you chickens for teaching us all such a lot. I have learnt what ‘Mescamphus’ is, that chickens cannot swallow or urinate, and a myraid of terms for bits of their anatomy. Natty has added so many new words to her vocabulary and can often be heard fluently chastising a naughty chicken for pecking her wellies. And the birds have provided us with muses for artwork and writing practise. Ok, I am displaying slightly odd behaviour such as singing ‘Daisy, Daisy, Give me your answer do’ to them when there’s no-one around. Or shining a torch in the dark to check they are all safely tucked in bed, whilst wearing PJs and wellies. Or preparing freshly cooked spaghetti tossed with broad bean shells and a dressing of ground egg shell and garlic powder for their teatime treat. But then what’s wrong with a little eggsentricity between friends! Yes, learning opportunities are everywhere. Luckily Natty's Head agrees and is fully behind a dual home/school education plan for this year. Thank you for linking up with the Spring Carnival. 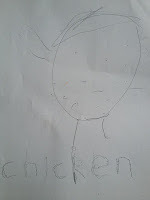 We love our chickens here too, great for the children to be involved with their care.